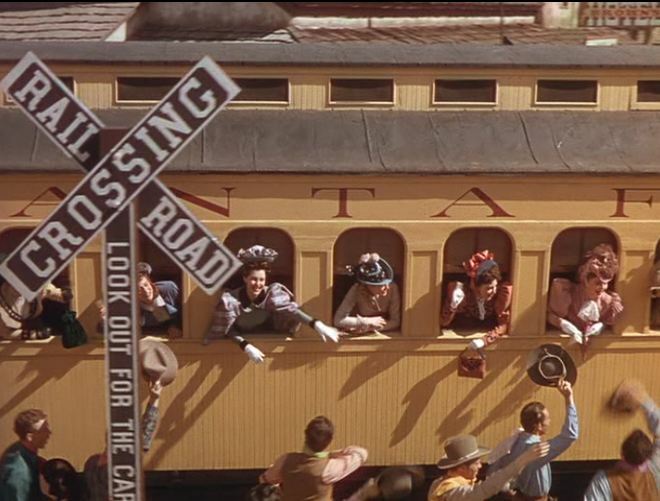 MGM’s splashy Technicolor musical tells the story of Fred Harvey and his famous waitresses who helped “tame the west” along the Santa Fe Railway. 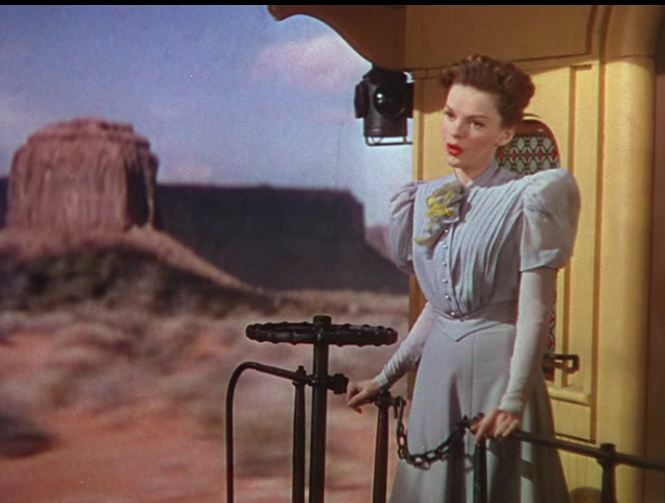 Judy Garland (Susan Bradley) stars as the plucky gal-who-came-West-to-marry. 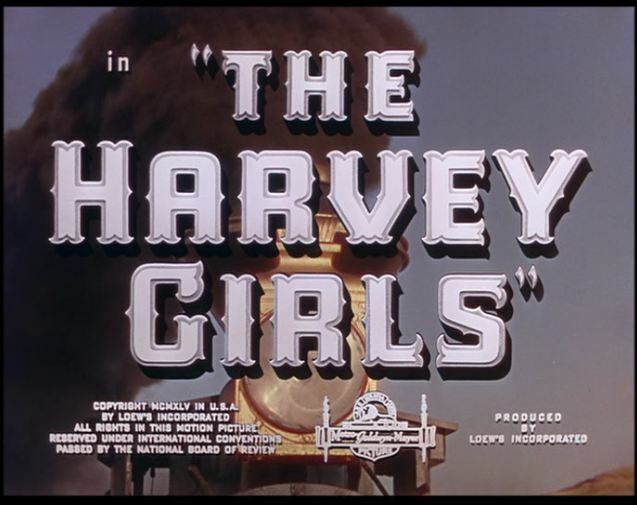 After discovering her intended is a philandering bum, she signs up with the Harvey Girls instead! 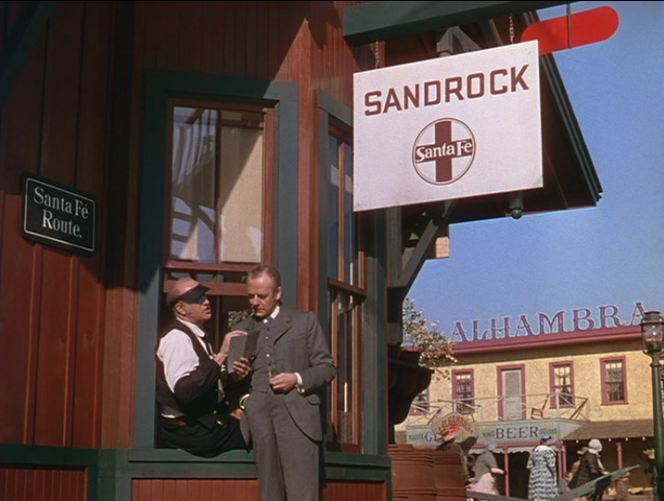 The Sandrock depot (on the Santa Fe Route) displays a red train order board, bay window, and stationmaster complete with visor. 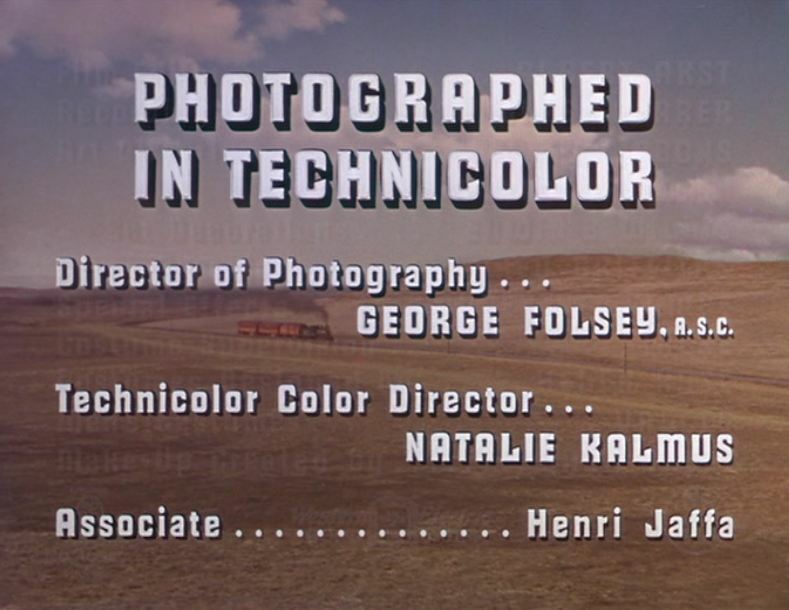 If you look closely on the “Photographed In Technicolor” title card, you can see the 3 orange passenger cars from “Dodge City”. 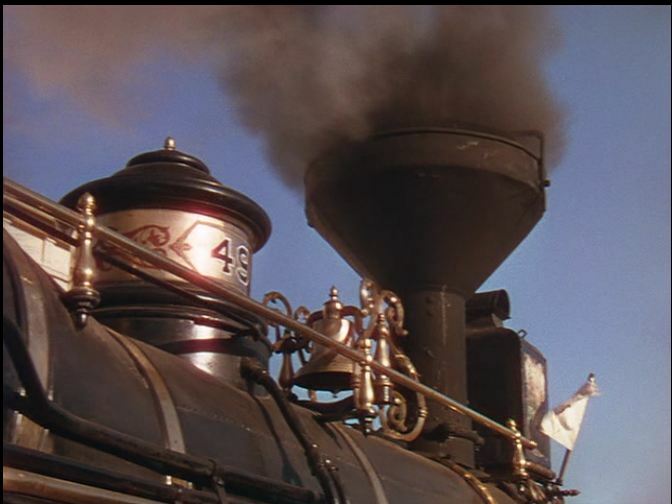 In “Harvey Girls”, all the coaches are painted yellow; Tight shot of ATSF 18 belching smoke. 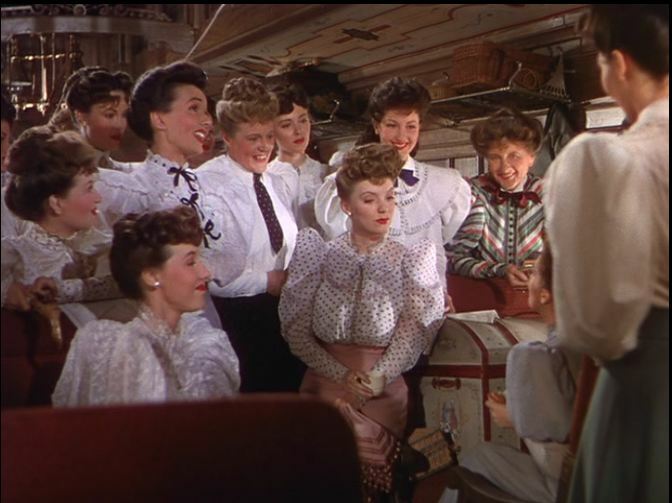 Judy Garland croons a little number from the car platform; Judy meets a mess o’ Harvey Girls on the train ride west. 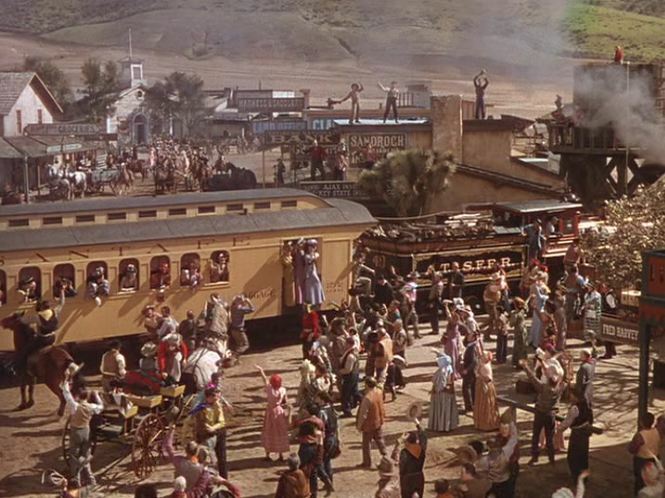 Santa Fe 49, the “Wm B. Strong”, complete with singing engineer & fireman, rolls a trainload of Harvey Girls towards Sandrock. 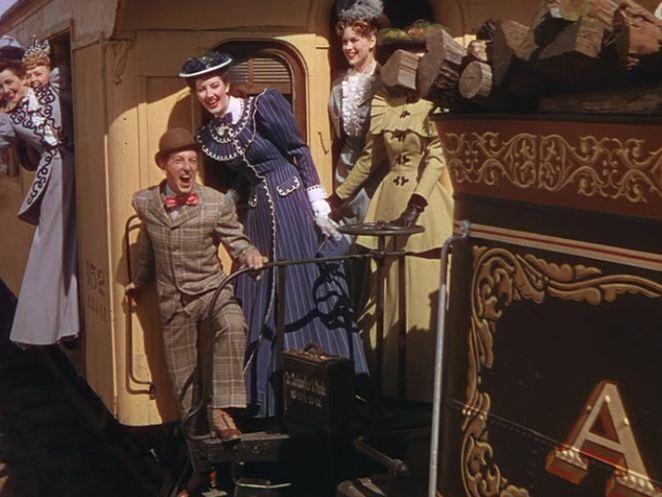 It’s Ray Bolger! (The scarecrow from the Wizard of Oz) Dig those natty shoes and outfit! No wonder the boys are so excited. 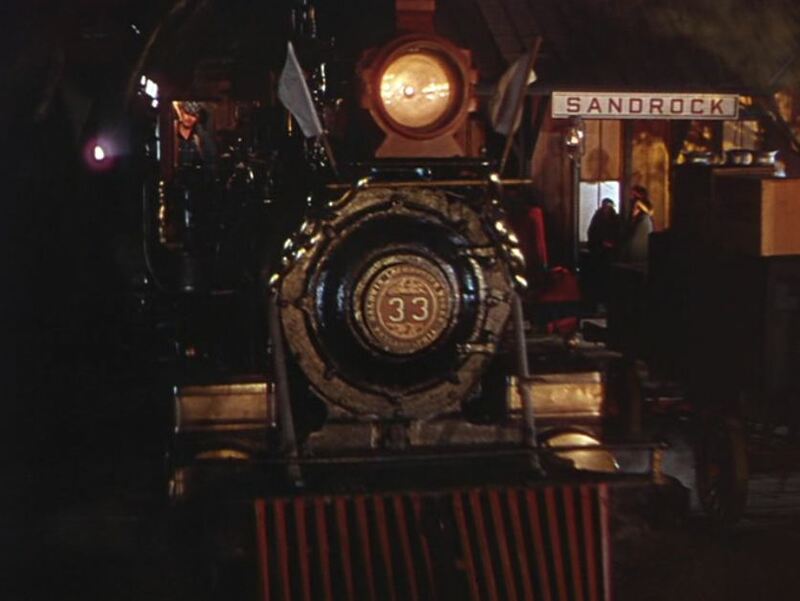 An entire trainload of feminine pulchritude has arrived in Sandrock! 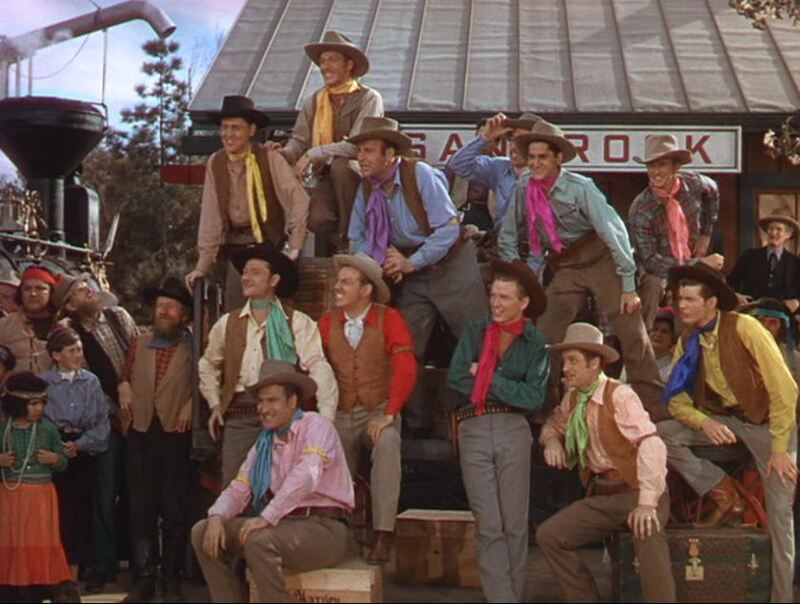 Early Technicolor pictures meant they were going to darn well use every color shade known to mankind; Judy Garland and Ray Bolger lead the cast alongside the Wm. B. 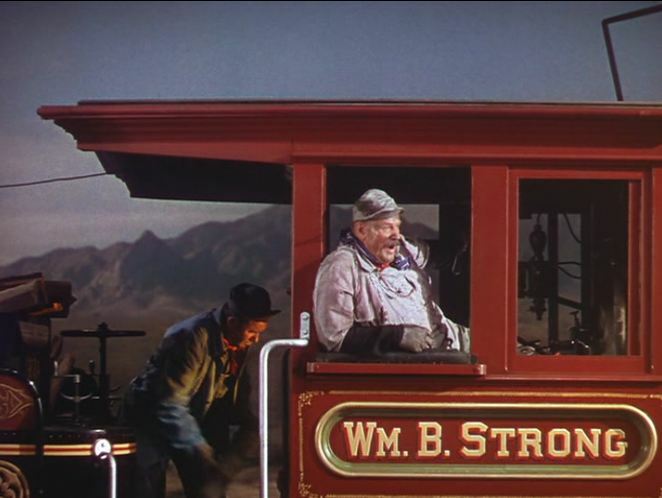 Strong during the finale of “On The Atchison, Topeka and the Santa Fe” (which won the 1947 Oscar for Best Music, Original Song). Nighttime in Sandrock. 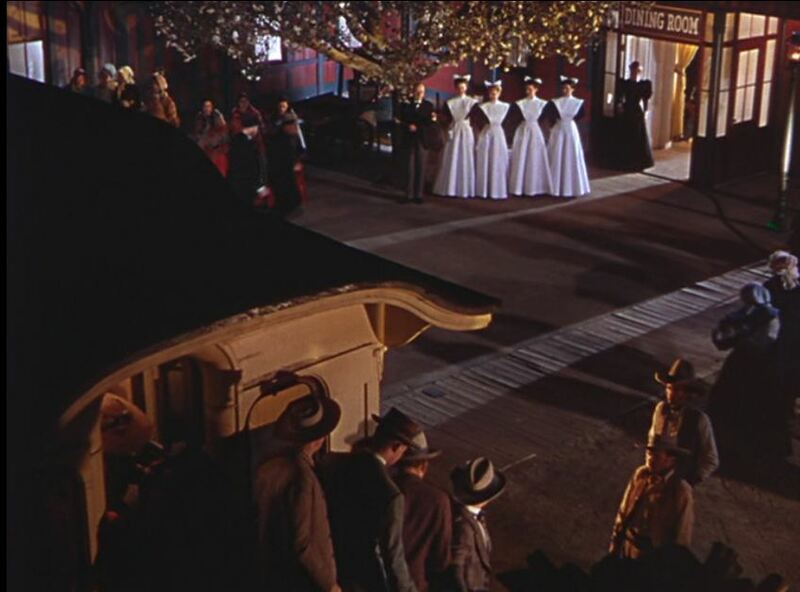 ATSF #33 arrives and passengers make their way to the Harvey House as the waitresses line up to greet them. Oh, you kid! 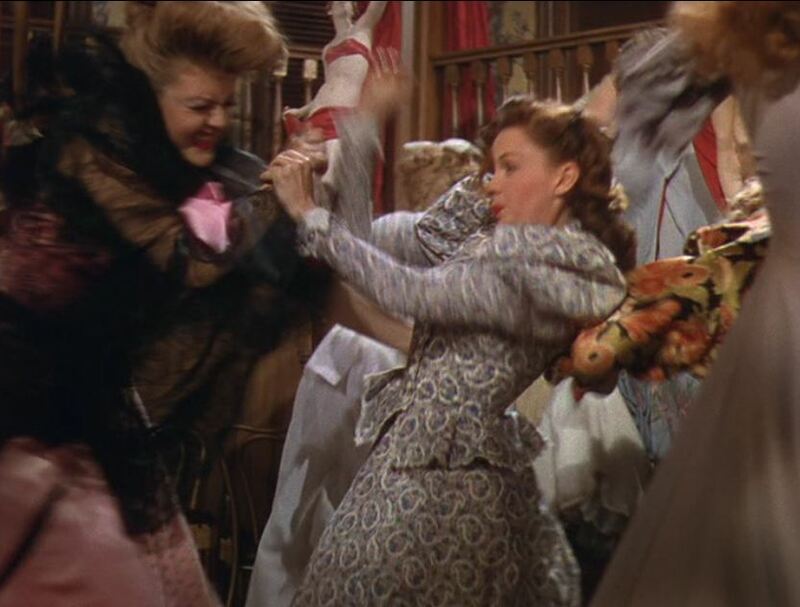 Angela Lansbury (Em’s) big number at the Alhambra Saloon; Catfight! 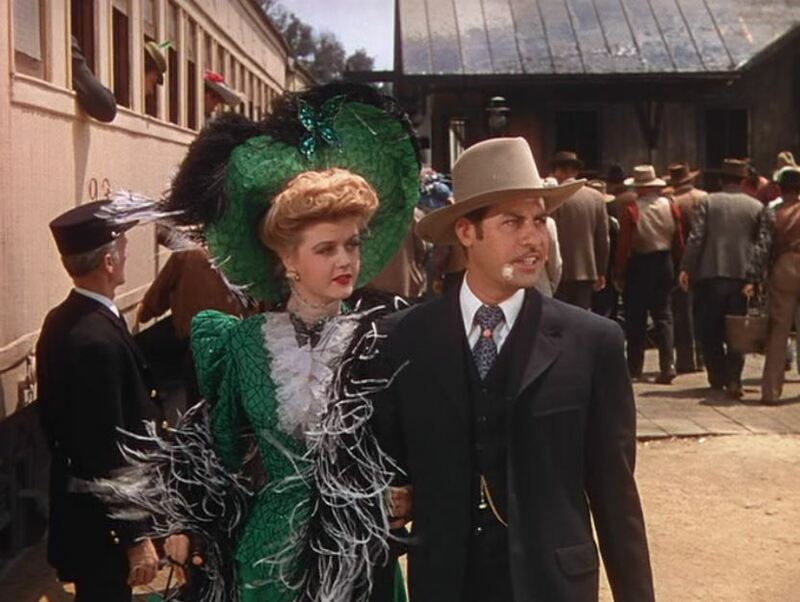 As a rival for John Hodiak (Ned Trent’s) affections, Judy and Angela duke it out in a saloon vs. Harvey House donnybrook. 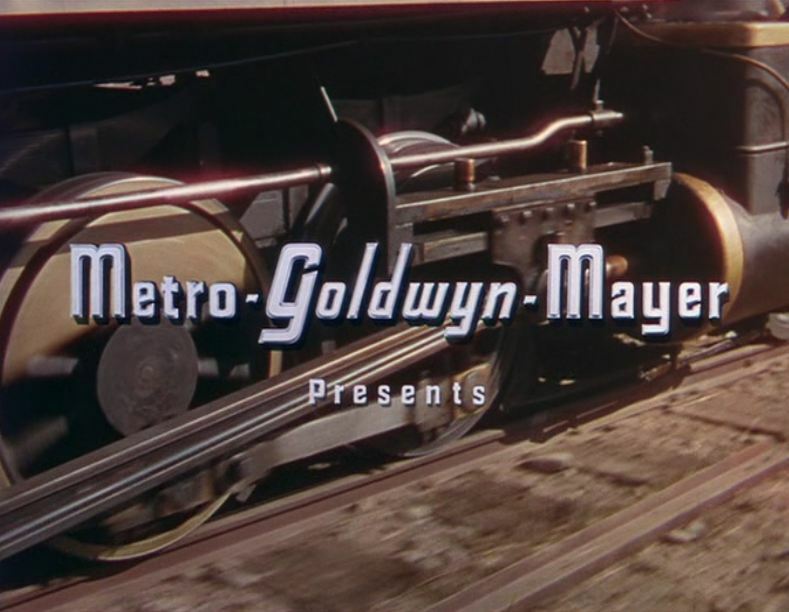 Nice interior shots – Em reconciling with Judy; Em pulls the emergency brake to set Judy off the train to be with Ned! 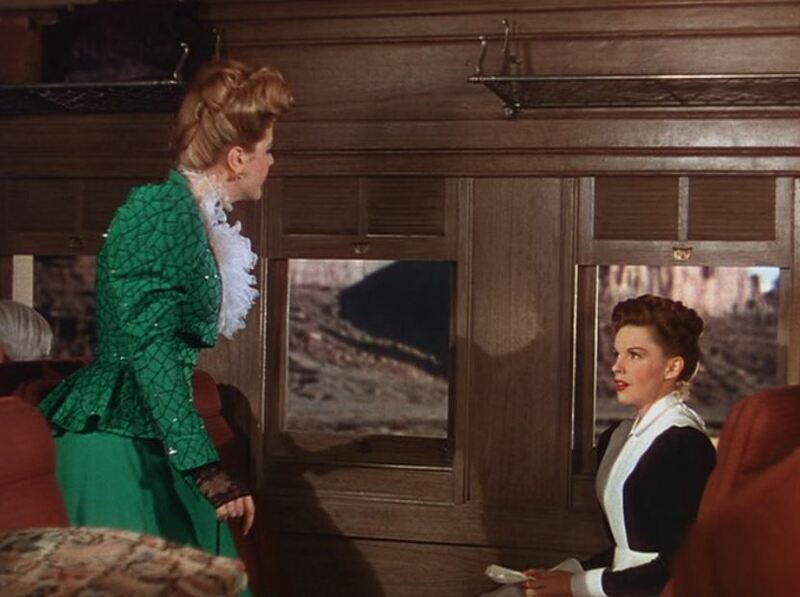 Trivia bit – when Judy Garland tells Em she’s headed to the next stop of Flagstaff, that places Sandrock somewhere near that Arizona town along the AT&SF mainline. Summary. 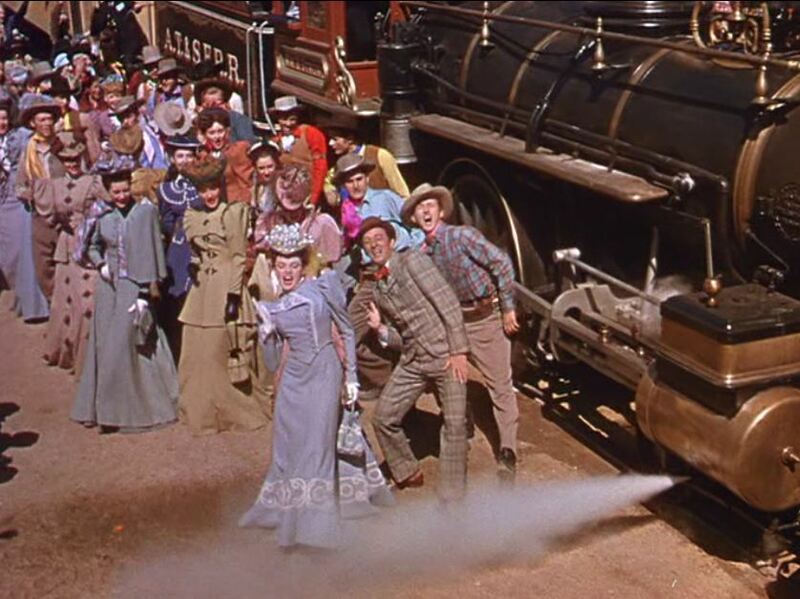 It’s a fantastic movie – worth it for the musical numbers, if nothing else. 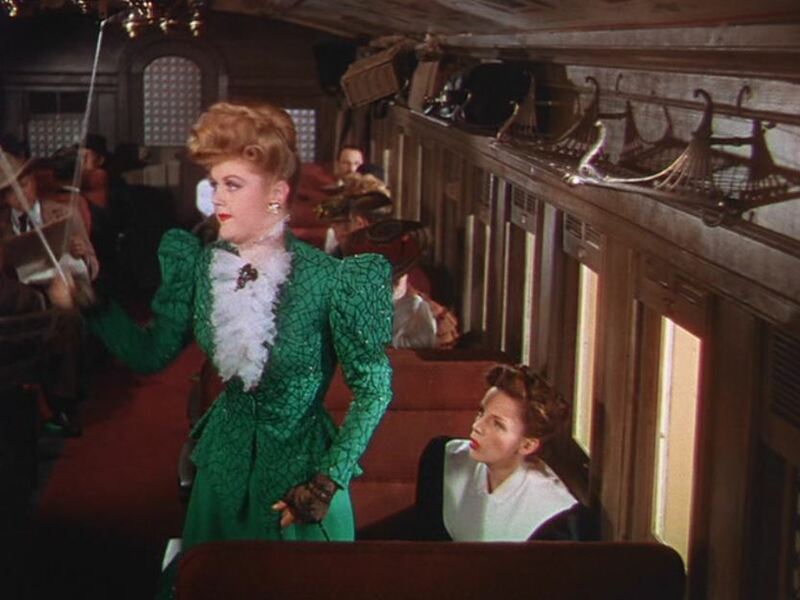 The train scenes are a little thin, but it’s more about the Harvey restaurant chain than the railroad. 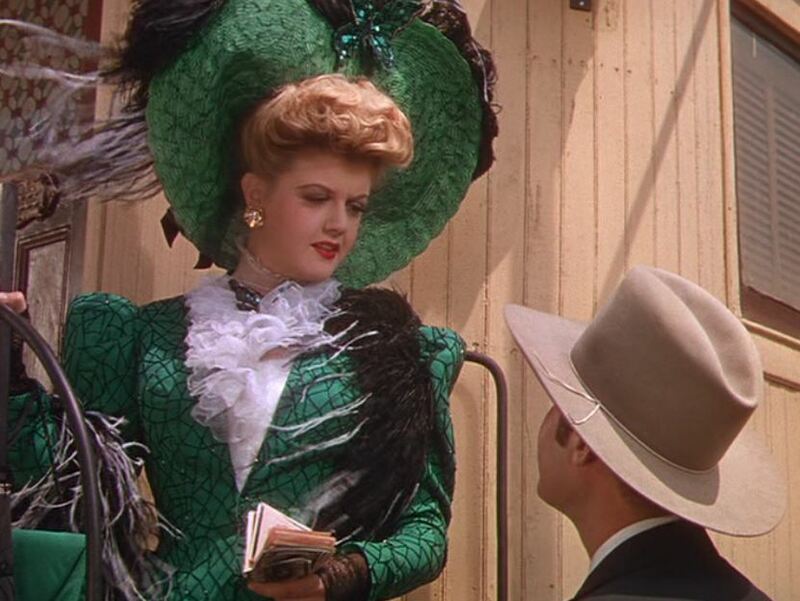 OK, it’s not very obscure, but where else can you see a 19 year old Angela Lansbury (Murder She Wrote) playing the prostitute with a heart of gold? Stream this, sit back and enjoy! 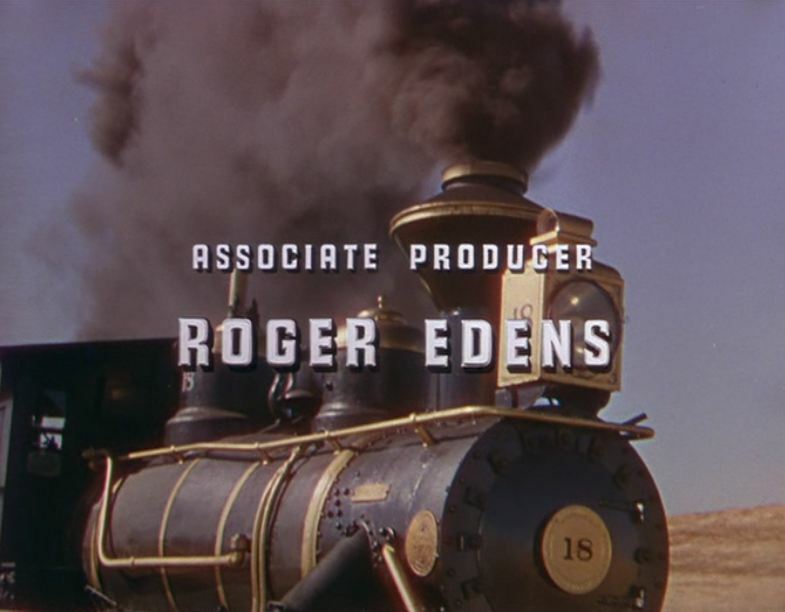 This entry was posted in Uncategorized and tagged 20th Century Fox, Angela Lansbury, Atchison Topeka and Santa Fe Railroad, Fred Harvey, Judy Garland, Ray Bolger, Santa Fe Railway, Sierra Railroad, The Harvey Girls. Bookmark the permalink.